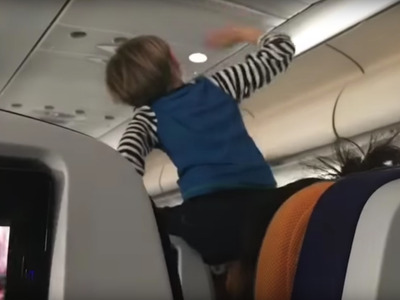 YouTube / Shane TownleyA video of a toddler disrupting passengers on an eight-hour flight has become the subject of controversy. How airlines should handle children is one of the most polarising questions surrounding air travel. The split reaction to a YouTube video that shows a toddler disrupting passengers on an eight-hour flight illustrates how controversial the issue has become. There’s no silver bullet, as any proposal involves a sacrifice. The story raises one of the most polarising questions surrounding air travel: How should airlines handle children? The answer depends on the rights you think airline passengers have. Should an airline ticket guarantee the right to fly with minimal distractions, or just the right to fly? A YouTube video from August that shows a toddler screaming, climbing on a chair, and running through the aisles during an eight-hour flight from Germany to New York illustrated the sharp divide between those who sympathize with disruptive children and their parents, and those who think they’re a nuisance. “Total lack of discipline..perhaps Crew should have removed said child and parents for violating safety regulations,” one person wrote in the video’s comments. “Shame on the person filming this minor! Putting his identity public. You should be very proud of yourself get up and offer help rather than criticising. The kid may have had learning disabilities or something,” one person wrote on Twitter. A 2017 survey from Airfarewatchdog found a nearly even split between the two camps, as 52% of respondents said families with children aged 10 and under should have to sit in a section separate from other passengers. “I don’t know why that hasn’t happened,” Airfarewatchdog content editor Tracy Stewart told Business Insider, noting that international airlines like IndiGo, Scoot Airlines, AirAsia, and Malaysia Airlines have taken steps to separate children from other passengers. There’s no silver bullet that would please both sides, as any proposal involves a sacrifice. The current model, letting parents and young children sit wherever they please, may force a large number of passengers to sacrifice their comfort if the children are loud. But making families with young children sit in a designated section could compound the stress parents feel when flying with children. Creating designated, child-only seating areas could become a nightmare for flight attendants, and banning young children from planes entirely would make long-distance travel impossible for some families. If nothing else, parents can defuse tension before it builds by acknowledging the discomfort their children can cause and making gestures to try and ease the pain, like buying drinks or snacks for nearby passengers. “At the end of the day, I think it’s incumbent on the parent to try and do symbolic things that help make up for the cost of their children on everyone else,”Airways senior business analyst Vinay Bhaskara told Business Insider. No matter how the debate is resolved, it will likely produce stress for everyone involved. And that’s nothing new for air travellers.